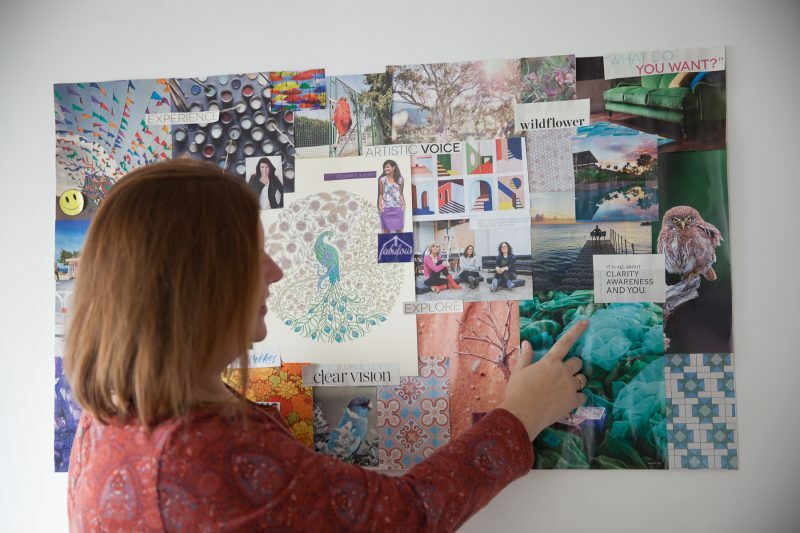 I am sure you have heard many coaches talk about vision boards and how they can help you achieve your dreams...and it is very good to highlight the deeper business goals and help make them reality. There is a lot of power behind a vision board, but only if it is created in the right way and placed in the correct situation. The power is linked to setting your goals and intentions and dreams out in the world for you and others to see. A vision board is created by engaging your subconscious. And the best way to do this is to gather together a series of magazines that you are attracted to the content - whether by the headlines, the colours or the photos. Full written instructions are at the base of this post. DON'T rely on app such as Pinterest. Yes, Pinterest holds a host of images that pull you in and you lose hours in there... the Pinterest algorithm sees what you have pinned and shows you more of the same. This is NOT what we want when creating a vision board. BUT if you have certain images in your own Pinterest board that really pull you in, then PRINT these out and add to your collection of cuttings from magazines and newspapers. This is a critical part of the vision board process. Place you completed vision board in a room where you are often. If you work from home, have this up near your desk. If you commute to an office, then have your vision board near your dressing board so you can see it every morning and evening. Also take a photo of your vision board and use this as your desktop backdrop. Listen to my video below to get more tips on why and how to create the best vision board for you. Sit quietly and set the intent. With lots of kindness and openness, ask yourself what it is you want. Maybe one word will be the answer. Maybe images will come into your head. Just take a moment to be with that. This process makes it a deeper experience. It gives a chance for your ego to step aside just a little, so that you can more clearly create your vision. Go through each magazine. Tear out images that delight you. Don’t ask why. Just keep going through the magazines. If it’s a picture of a teddy bear that makes you smile, then pull it out. If it’s a cottage in a misty countryside, then rip it out. Just have fun and be open to whatever calls to you. Then, as you go through Step 2 below, hold that same openness, but ask yourself what this picture might mean. What is it telling you about you? Does it mean you need to take more naps? Does it mean you want to get a dog, or stop hanging out with a particular person who drains you? Most likely you’ll know the answer. If you don’t, but you still love the image, then put it on your vision board anyway. It will have an answer for you soon enough. Some women I work with have NO idea what their board was about, and it wasn’t until two months later that they understood. The Clarity Vision Board can be a powerful guide for you. This goes deeper than just getting what you want. It can speak to you and teach you a little bit about yourself and your passion. To begin with, keep these in 3 separate piles, as this can be easier when then composing the vision board itself. Step 2: When you are ready to stick your vision board together, go through all the elements you have acquired one more time, and take out any pieces that no longer resonate with you. Go through the images and begin to lay your favourites on the board. Eliminate any images that no longer feel right. It is highly likely that there will be some images that you have no idea why your eye (and mind) connected with these, but for some reason you do - these are super important to place on your vision board as time will show you why these were there. This step is where your intuition comes in. As you lay the pictures on the board, you’ll get a sense how the board should be laid out. For instance, you might assign a theme to each corner of the board. Health, Job, Spirituality, Relationships, for instance. Or it may just be that the images want to go all over the place. Or you might want to fold the board into a book that tells a story. There are many creative ways to present a vision board, and all are unique and right for you. There is no limit to the size of your vision board - though I recommend trying to keep it at A1 size or smaller - just because this is easier to then find a space on your wall to hang so you can keep it in sight, as for a vision board to manifest, your eyes musty see it regularly. The backing for the photos can be sheets of newspaper taped together, old cardboard, or a brand new piece of card bough t specially for the project. My last vision board was 2 pieces of A2 paper taped together. Just see what you have around you! Step 3: Glue everything onto the board. You will also need glue to stick down the images - like a glue stick - the glue should not make the images ripple when glued. Add writing if you want. You can paint on it, or write words with markers. Step 4: (optional, but powerful) Leave space in the very centre of the vision board for a fantastic photo of yourself where you look radiant and happy. Paste yourself in the centre of your board. Then revisit this exercise every year and see what has come about, what has changed, and what you are still working towards.